Chile peppers have been misunderstood ever since a clueless Christopher Columbus named them after peppercorns for their spicy quality, even though the tasty fruit of the genus Capsicum aren’t related to peppercorns. 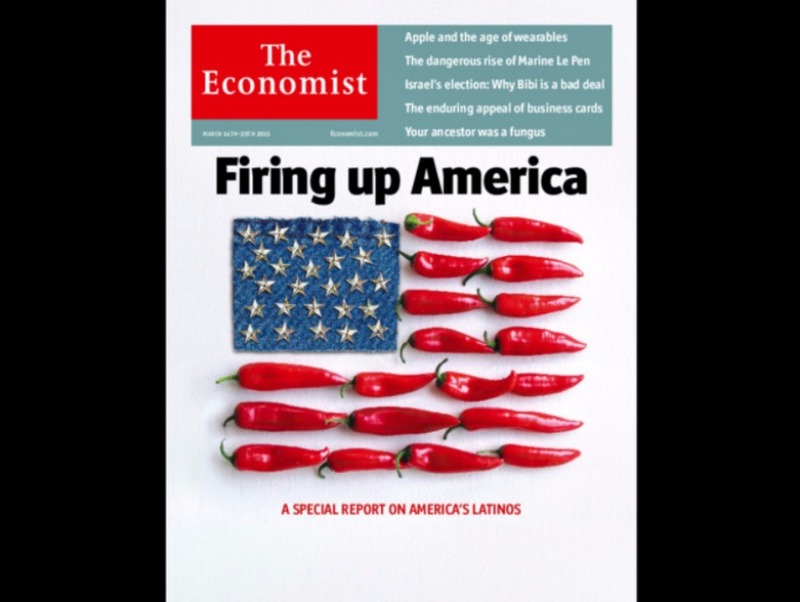 So it came as no surprise that when the latest cover of The Economist portrayed Latino immigration to the United States as an American flag made of red hot chile peppers, many Latinos were upset–because, the truth is, the majority of Latin American countries can’t handle spicy foods. So, I’m here to set the record straight on Latinos and our reputation for hot tempers (sometimes true), hot women (very true) and hot peppers (not true). Chiles originated in South America and made their way up through Central America and into Mexico—today, Mexico counts around 150 different chiles used in regional cuisines, but none hotter than the habanero (a staple in the Yucatan but used nationally as a hot condiment) and a few other scorchers like chiltepin, manzano, piquín, and chile de árbol. Then come the medium-hot jalapeños and serranos, but the rest are mild and used for sauces, soups, stews, moles, salsas, marinades, for stuffing, and eaten whole. In Central America, Guatemala is the chile king with its many peppers like cobanero, siete caldos, and chiltepe, but these are used sparingly in cultural dishes, and with the exception of Belize (lots of habanero), the rest of Central America can’t handle the heat. In South America, it’s mostly northeastern Brazil that embraces a fiery cuisine with its pimentas (peppers): malagueta, dedo-de-moça, cumari, and pimenta-de-bode, which are mostly prepared in hot sauces or preserves. Spicy condiments are available all over Brazil, but most Brazilians would reach for ketchup before any hot sauce. In Peru, the mild ajís like ají amarillo, ají panca, and ají rocoto are used primarily as seasonings for sauces and stews. Ají sauces are common in Colombian and Ecuador, but the bit of tame chile isn’t even perceptible—if The Economist had done their homework, they’d have realized that most Latinos would start waving their hands in front of their mouth after a few drops of Tabasco.